Local and statewide information on a variety of current topics for home gardeners and market growers. BLOOMINGTON, Ill. – University of Illinois Extension McLean County Master Gardeners help thousands of local gardeners with their gardening questions each year. Questions range from the identification of plant, weeds, and insects, to tree problems and tips to growing vegetables and fruits in your landscape. While some questions can be answered immediately, many must be researched. Horticulture Educator, Kelly Allsup, says Master Gardeners "are kind of like plant detectives asking questions, looking at pictures and doing research." Master Gardeners are trained by University of Illinois specialists and Extension educators to answer questions from the community. They also have access to a wide variety of University of Illinois sources to help research to a solution. "An office visit is often helpful if a phone call does not do the trick," says Kelly Allsup, "Bring in your questions and any plant samples you may have." Samples should be enclosed in a plastic bag or container and should be fresh to obtain a good diagnosis. To prepare for your visit, you may view or print guidelines at go.illinois.edu/MGHelpDesk. 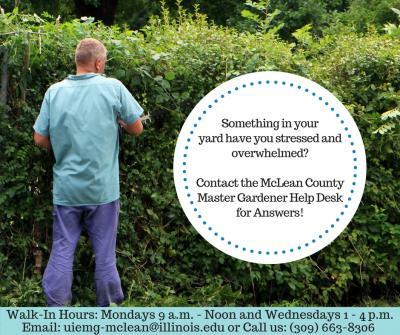 Visit the University of Illinois Extension Mclean County Master Gardeners' Walk-In Help Desk on Mondays, 9 a.m. to Noon, and Wednesdays 1 to 4 p.m. (1615 Commerce Pkwy, Bloomington). At the Downtown Bloomington Farmers Market booth, Saturday mornings from 7:30 a.m. to Noon beginning May 5 and running through October (Corner of Jefferson and Main, Bloomington). The Downs Famers Market booth, Wednesdays, 4 to 6 p.m., beginning June 6, and running through the end of September (at the southwest edge of Downs, near Franklin and Seminary, just off I-74). On the radio, first Wednesday of the month from 9 to 10 a.m., and the third Saturday of the month from 7 to 9 a.m. on WJBC AM 1230. The Master Gardeners can also be reached by phone at (309) 663-8306 or email at uiemg-mclean@illinois.edu. We are looking forward to spending another season solving horticulture mysteries in our communities.